Despite AzhwAr telling the samsAris many beneficial words, they were not in a position to receive such advice. Not considering their lowliness (since they were not listening to good words), he thinks of their sorrowful state and tells himself “even though they do not realise that their svarUpam (basic nature) is to serve only emperumAn, if they say once, without any restraint, ‘thiruvarangam’, this hell-like samsAram will disappear and grass will grow where it once was”. ozhiyum anRE – will it not go waste? eRiyum nIr veRi koL vElai mAnilaththu uyirgaL ellam – all the creatures living on this huge earth, surrounded by oceans with lapping waves and smell of fish. AzhwAr has used the term “eRiyum nIr” which means that these chEthanars (sentient beings) who are qualified to live comfortably in the expansive paramapadham (SrIvaikuNtam) are living like crowded jackal caught in flood (periya thirumozhi 11.8.5 “veLLaththidaippatta nariyinam pOlE” – like a pack of jackals caught in flood). “veRi koL vElai” – he says that instead of being in SrIvaikuNtam enjoying the sweet fragrance of thuLasi [which he brings in the next line] these chEthanars are on earth, being the target of foul smelling ocean. “mAnilam” – earth with an expanse of 50 crore yOjana [one yOjana is 10 miles or 16 kilometers][ a word of caution here – the term earth (bhUmi) as our pUrvAchAryas say should not be mistaken for this earth that we live. It encompasses all the 14 worlds (athala, suthala, pAthAla etc comprising 7 worlds below the earth that we are familiar with and bhU:, bhuva:, suva: etc comprising 7 worlds from earth upwards. The entire distance between these 14 worlds is 50 crore yOjana]. “uyirgaL” – if the connection with these dhEham (body) is removed, the AthmA is qualified to be like SrI kousthubam (the radiant garland adorning emperumAn’s chest); instead he is remaining here like a wastrel, feels the AzhwAr. “ellAm” – includes the independent-minded celestial people (dhEvas) and their citizens, the human race on earth. veRikoL puNthuLabamAlai viNnavar kOnai Eththa – It is not only nithyasUris who, looking at emperumAn adorned with sweet smelling and beautiful thuLasi garland, worship him. Even samsAris are meant to worship him. sumithrA tells lakshmaNa prior to his departure for forest with Sri rAma and sIthAp pirAtti “srushtasthvam vanavAsAya svanurakthas suhrujjanE I rAmE pramAdham mA kArshI: puthra! bhrAthari gachchathi II” – lakshmaNa! You were created for dwelling in the forest. You are having deep affection for SrI rAma who loves you dearly. My son, when SrI rAma walks ahead, do not make the mistake (of admiring and engaging with his gait and losing sight of those who would harm him). Just as lakshmANa was created only to serve SrI rAma, the samsAris were created only to serve and worship emperumAn. aRivilA manisar ellAm arangam enRu azhaipparAgil – despite being born in the human race where they are supposed to be with the knowledge of discriminating [between good and bad, high and low, dos’ and don’ts’ etc], and even if they do not have any knowledge, and any involvement with thiruvarangam because of lack of that knowledge, it is enough if they merely say “thiruvarangam”. Usage of the word “Agil” (if) denotes that many of the samsAris with high degree of pApa (sins) could not say even this. poRiyil vAzh naragam – those living in leelA vibhUthi (materialistic realm), enslaved by their senses. “poRi” – in the meaning of trap, this indicates that the senses, in all situations, would trap samsAris so that they cannot escape in any way. “naragam” – to those without knowledge, yama lOkam (the dwelling place of yama) is narakam (hell). But for those with knowledge, samsAram itsel f is hell. samsAram makes samsAris believe that living a life on it is the greatest thing and does not allow them to think of paramapadham (SrIvaikuNtam). nammAzhwAr says in thiruvAimozhi 8.1.9 “nanRum anjuvan naragam nAn adaidhal” – I am scared that I will lose my SEshathva gyAnam (knowledge that I am your servitor) if I stay in this samsAram called narakam. 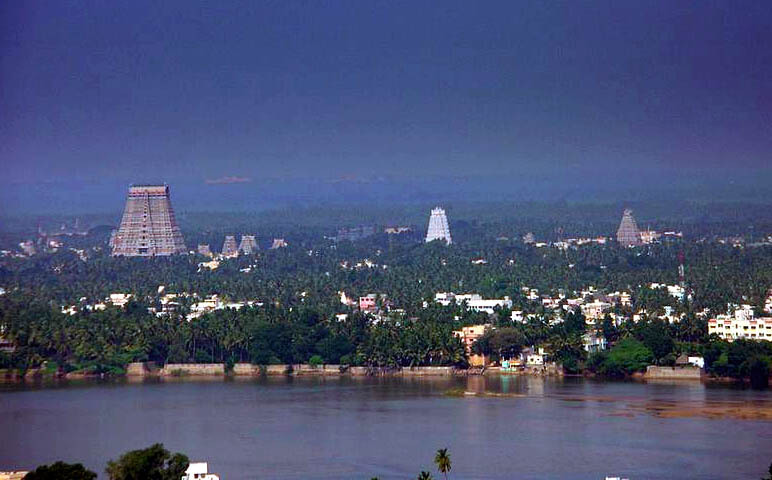 ellAm pul undhu ozhiyum anRE – if all the samsAris leave samsAram and reach paramapadham, the leelA vibhUthi will lose its fields of samsAris and become arid. We shall now move to the 14th pAsuram. This entry was posted in mudhalAyiram, thirumAlai on September 9, 2016 by T N Krishnan. There is a daily update from SrI sArathy swAmy (please see Koyil.Org@gmail.com) posting several translations which are taking place as well as pictures of uthsavams in various dhivyadhEsams.